All Terrain Vehicle Hire, Perthshire, Scotland. Customer Testimonials. 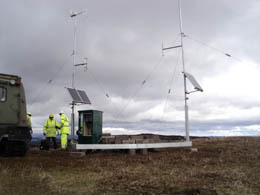 "We needed a comms mast installed on a windfarm site, prior to construction works commencing, for health and safety reasons. The Hagglund provided by David was ideal as it had carrying capacity in the back for materials and equipment but also room for the installation team (2 comms engineers, 2 steel fabricators and me) in the front. The ATV coped well with the difficult offroad terrain and left no scars on the route used. Great all round machine - good job!" "I have used David and his Hagglunds for spreading materials on rough terrain on a number of occasions now and each time the jobs have been completed without any problems or delays, using 2 machines David and his team can spread 5000 meters of deer fence materials onto hill ground from start to finish in well under 2 days without leaving any scars on the ground. Overall a very reliable and cost affective machine for the job. "